n update after my little Jedi’s unfortunate experience from the other day. Today we found ourselves in the same area of Disneyland when it came time for lunch. Wouldn’t you know, just as we managed to find a table and get the kids all settled down the Star Wars music pipes up and the Jedi Training Academy started up again in full. My boy says to me “Daddy, I want to go watch the Jedi Training Academy”. My wife and I both give each other “the look”. “Yes, I want to” was his firm reply. So I put my little Padawan on my shoulders and walked him over to a better viewing position in the audience. I asked him at least three more times if he was sure he wanted to watch the show. “Yes, I want to” he repeated every time. The same script as before. The same actors. The Stormtroopers come out. Darth Vader comes out. 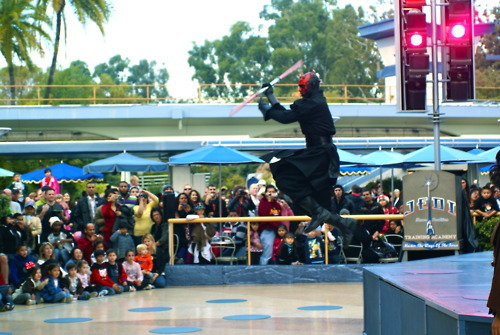 Then Darth Maul comes out. 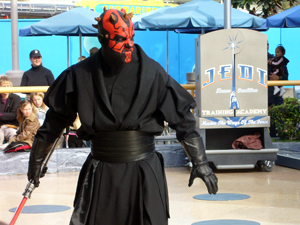 Darth Maul does his kung-fu (Taras Kasi for all you Star Wars nerds out there) and prowls around the audience with his menacing scowl once again. Wouldn’t you know it. Darth Maul winds up 12 inches away, face-to-face with my son again, just two days after utterly destroying my poor boy with his creepy yellow contact lenses and prosthetic sharp, pointy teeth. He lingered, playing it up to the tender little 3-year-old sitting on top of my shoulders. 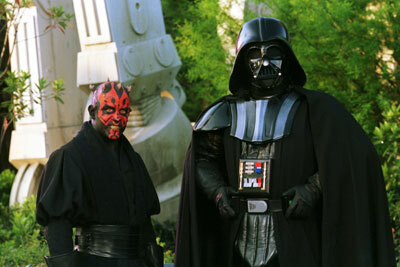 The Sith warrior skulked away and back into the Jedi Training Academy script. Here’s to my little Jedi, getting back on the horse (or on the Bantha as it were). The Force is strong with you. Pass on what you have learned.